Hello SB friends! I had a huge ah-ha last night that I would like to share with you! It was one of those moments when you know something, have forgotten it, and then have the pleasure of learning the lesson again. This happens to me a lot. Last week I had several interesting conversations with different friends. There seemed to be a challenge that a lot of us are trying to work through right now. Think about that for a moment. 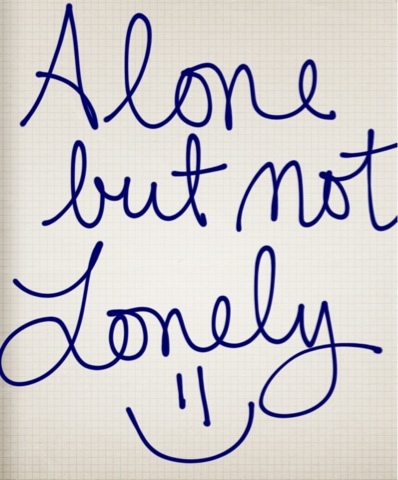 What is loneliness? What are we really feeling and what are we saying to ourselves when we are lonely? Sometimes we think that we are alone. There is no one there for us. We are waiting to feel validated and loved by other people. I learned that I was surrounded by love and acceptance, but because I did not love and accept myself, I did not see what was right in front of me. How did I shift that belief that I was lonely do you ask? Well it started with one thing. I took the opportunity to be still. To be all by myself. To contemplate my life. To listen for revelation from my Father in Heaven. To untangle the thoughts and limiting beliefs that were blocking my greatness from being seen. As I have done these things, I was able to come to a place where I loved and accepted myself. And when I finally came to that place, I didn't feel lonely anymore. I had myself. I was better able to love and accept others. To serve them. Sadly, I had some learning opportunities come my way and instead of remembering these things, I went back to my old patterns and started to feel lonely again. I am so grateful for this opportunity though! It has helped me to remember how precious and amazing my life really is! If it wasn't for times like these, I wouldn't really, truly appreciate the goodness in my life! Yesterday I was reading a blog called "Dripping with Passion". She was talking about this very thing and she shared an amazing quote from her high school english teacher, Susan Lake. "Never mistake aloneness for loneliness. In order to grow, you need time away. Away from the noises of the world, friends, comfort, and all distractions to find what is important and fulfilling. These alone moments build character and show the level of patience you are willing to endure to find the Spirit and wrestle with thoughts that tell you you aren't worth anything or you can't do it right. "Change these moments of loneliness into ones of aloneness. Alone, and all by yourself, do as the Savior taught you to do: serve. This takes courage and sacrifice of your self-centeredness. Endure being alone to find that you are loved and have love to give. That decision made in your heart will bring a glow to you that will attract others to you. You won't be lonely because you will have yourself, those you give to, and the Savior guiding you through." I love that, "Never mistake aloneness for loneliness." We need that time to grow and build our character. I love the reminder of this as I sometimes give in to the heartrending feeling of loneliness. I am now committed to not letting my aloneness surface as loneliness. I am looking for ways to serve and love others. I am following the Spirit and using my greatness as my Father in Heaven would have me do. I am living my SOULFUL BRILLIANCE! I would love to hear from you! Tell me your thoughts on this subject. What are you committed to doing this week to make sure your aloneness doesn't surface as loneliness? ﻿Hello friends! It feels like forever since I last posted! I have been busy with some new creations for Soulful Brilliance and can't wait to share them with you! Watch for more on this at a later time! Today I would like to talk to you about loving yourself. This was a big shift for me in the beginning of my journey. I was a perfectionist and believed everything I did had to be perfect and that I "should" be doing a lot more than I was or I "should" be doing better at what I was doing. Because of this mindset, I was not very nice to myself. I don't think I consciously thought of it as being mean to myself, but it was. I finally realized what I was doing and had to work hard on shifting it. 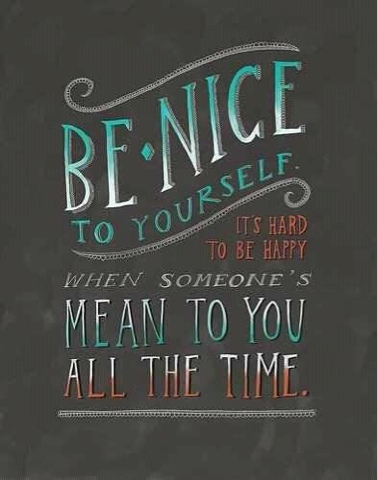 As I've been thinking of my experience, been to different seminars and retreats, and heard different people telling their stories, I discovered some general reasons why many people are not nice to themselves. First, we believe we are not good enough. Second, we don't think we're worthy. Third, we aren't attractive. For myself, it was all of these things. In order to shift these beliefs I had the opportunity to start having a serious talk with myself every night. I would stand in front of my mirror, look myself in the eyes, and tell myself that I was beautiful! That I was deserving! That I was enough! That I was an amazing person! I would also tell myself all the amazing things I had done during the day. And of course, that I loved myself! I will admit that at first it was a completely emotional experience. I hadn't thought those things about myself for so long. Saying them and really trying to believe them was at first really hard, but as I repeatedly told myself these things, I started to believe them. It was empowering! The more I believed them, the nicer I was to myself without thinking about it. My days became better! I was happier! I had more energy to assist other people around me! It didn't just serve myself to do these things, it helped the people around me as well! Loving yourself will change your life! It is my hope that you love yourself, so you can be happy and create the kind of life you truly wish to live! My challenge to you this week is to try the Mirror Exercise that I described above. Stand in front of a mirror and tell yourself that you are amazing, worthy, enough or whatever you feel you need to hear from yourself. Tell yourself what a great job you did during the day even if it was that you got up and breathed in and out. And most of all don't forget to tell yourself that you love you! Don't forget how amazing you truly are! Please let me know how your doing with the challenge by commenting below or send an e-mail to me at meg@soulfulbrilliance.com! I would really love to hear your stories!